So your interested in learning about Web Components and creating your own custom HTML tags? In this post we’ll explore the basic syntax and concepts to allow you to start dabbling with Custom Elements and Shadow DOM. We’ll create a silly <my-title> custom element that simply stamps out a styled title. Not very useful, but it’ll help demonstrate a few starting concepts. Inside the ES6 class, this refers to the element instance itself. The connectedCallback method is triggered once the element is added to the DOM. There’s also a disconnectedCallback method that gets called upon removing an element from the DOM that’s useful for cleaning-up things like event handlers. We register (define) the custom element with customElement.define and passing-in the tag name as the first argument and then the class that defines the element as the second argument. Defining the element is what then allows us to use it in our HTML documents. Note that tag names should be at least two words, separated with an hyphen. That’s to prevent any future HTML element from colliding with custom elements. That’s not great and is not even foolproof if there’s another element with the wrap-my-title somewhere in your markup. Plus, it would be more performant and much nicer if we could use simple CSS selectors like h1. This is where Shadow DOM comes in. Shadow DOM allows us to scope our styles to our custom elements so that they don’t bleed out. 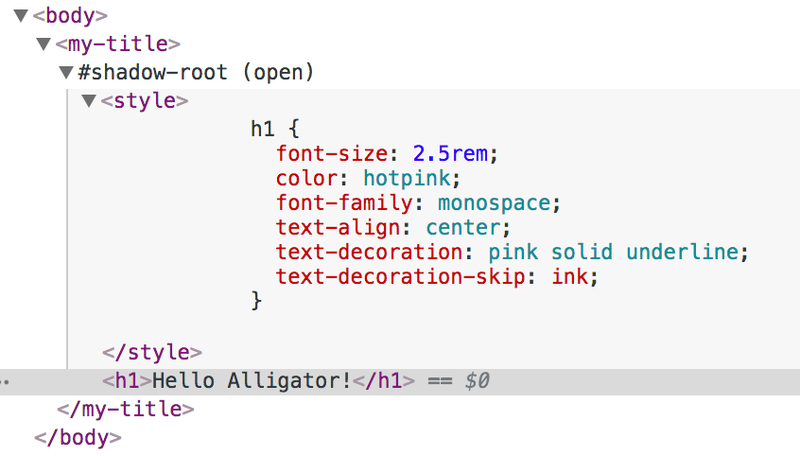 The class constructor is a good place to attach a shadow root and define its inner html. When a custom element’s class has a constructor, you should always call super() in it. The mode for the shadow root can be either open or closed. You’ll probably only ever use open, because otherwise you wouldn’t be able to set any innerHTML for it.